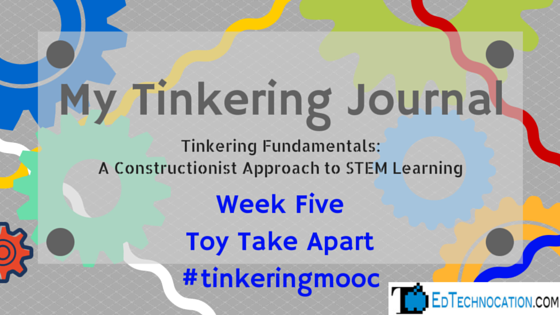 I've been looking forward to week five of the Tinkering Fundamentals online course! This week was Toy Take Apart! Want to know what toy I demolished in the name of fun and adventure? Read on! I've been looking forward to this activity since I first registered for this course in the early Summer! I've been wanting to experience Toy Take Apart because of its fun nature and the opportunity to explore and take something apart! You get to recognize patterns in the way things are built. You develop and understanding of mechanical motion. You develop an appreciation for design. I wanted to to take myself through this activity and follow the Thinking Routine created by Agency by Design. 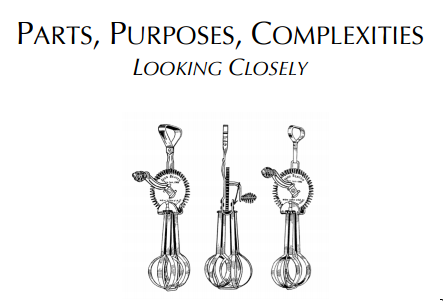 This Thinking Routine is called "Parts, Purposes, Complexities" (click the link to download their PDF resource). First, I started by examining the outside of the toy. 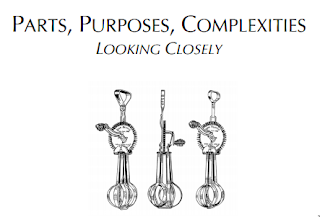 I created a list of all the things I could see on the outside and all made some observations about what I think the toy does and how it works. Then, I took the toy apart. This was extremely difficult because McDonalds (for good reason) did not want this toy to come apart. It had special screws that required a specialized tool and the plastic shell also snapped together in several places. So I took my handy power drill and drilled three big holes into the areas around the screws to loosen it up. That worked! The inside was very interesting to tinker with and you can see what I discovered below. I had a lot of fun with this activity. The next step might be to hack the toy and turn it into something new or add another complexity to it. I plan on using this activity with my Make It 101 class this semester. In fact, I have it planned for just a few weeks away. And just the other day I stopped by the Goodwill store and picked up the perfect toy to use with my class! A "Let's Rock Elmo" for $1! I'll be sure to document this as well on my blog a little later!